Hello, friends! I’m Michele from The Scrap Shoppe. I’m SO excited to share this project with you today. It’s crunch time, right? 3 days until Christmas!! So I have an awesome last minute gift idea that you can create in a mere 15 minutes! Yay!! 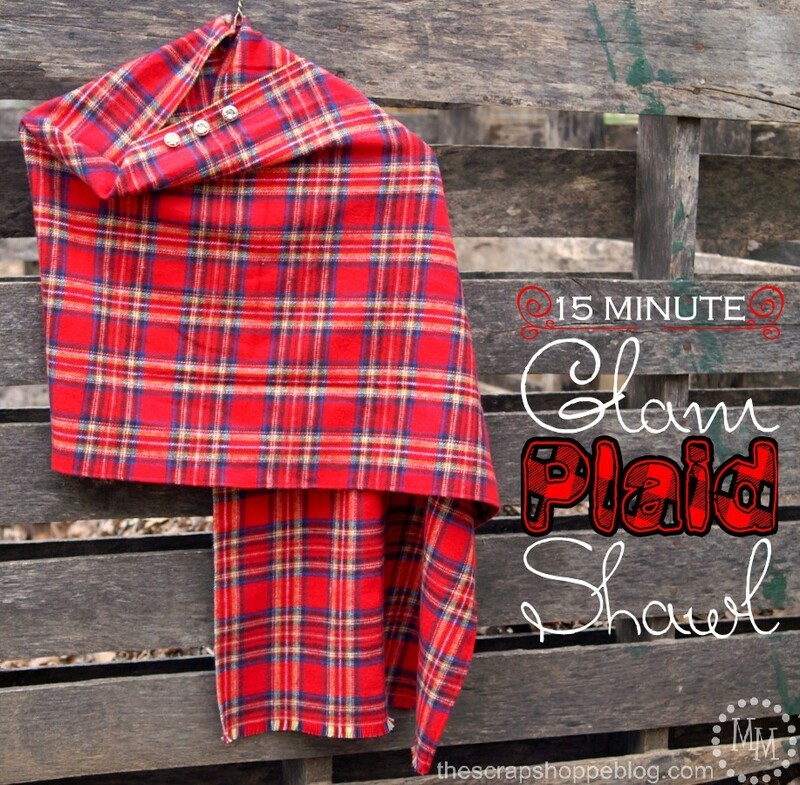 This Glam Plaid Shawl would be perfect for any of your girlfriends or female family members to receive for Christmas. And, while you’re at it, whip one up for yourself! I am a chronic fabric remnant shopper (and hoarder!). 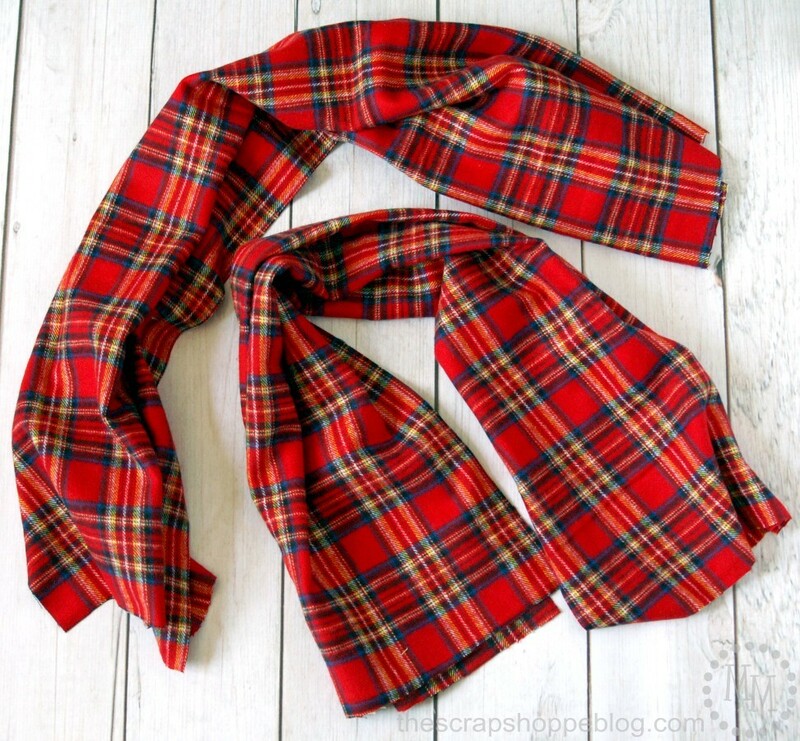 I recently came across a this lovely red plaid flannel in the remnants at Joann’s and had to have it! An entire yard for $2.50! Since remnant sizes do tend to vary I did double check the size. It was indeed 44″ x 36″. A yard is all you need to create this shawl. Cut the fabric into two†18″ x 36″ strips. Lay the strips of fabric on top of one another with the right sides facing each†another. 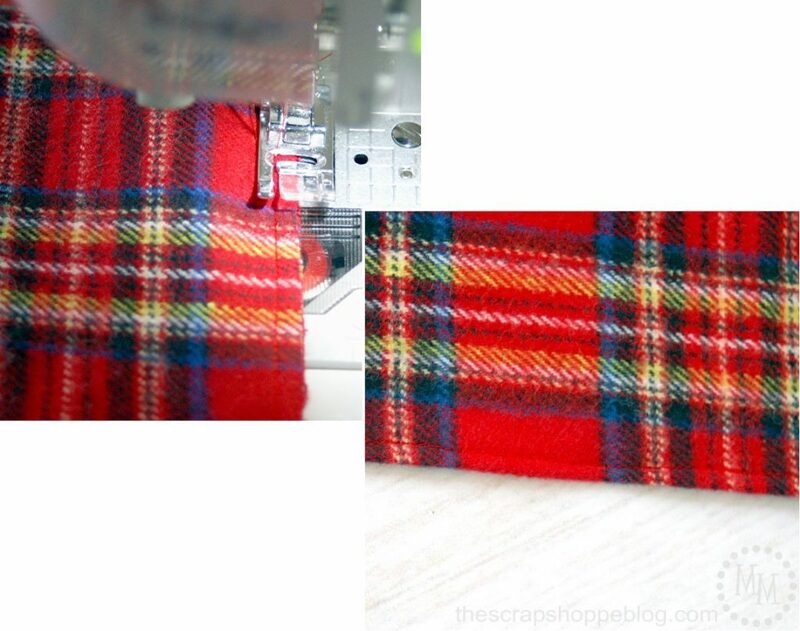 Stitch together one of†the short†ends with a 1/4″ seam. 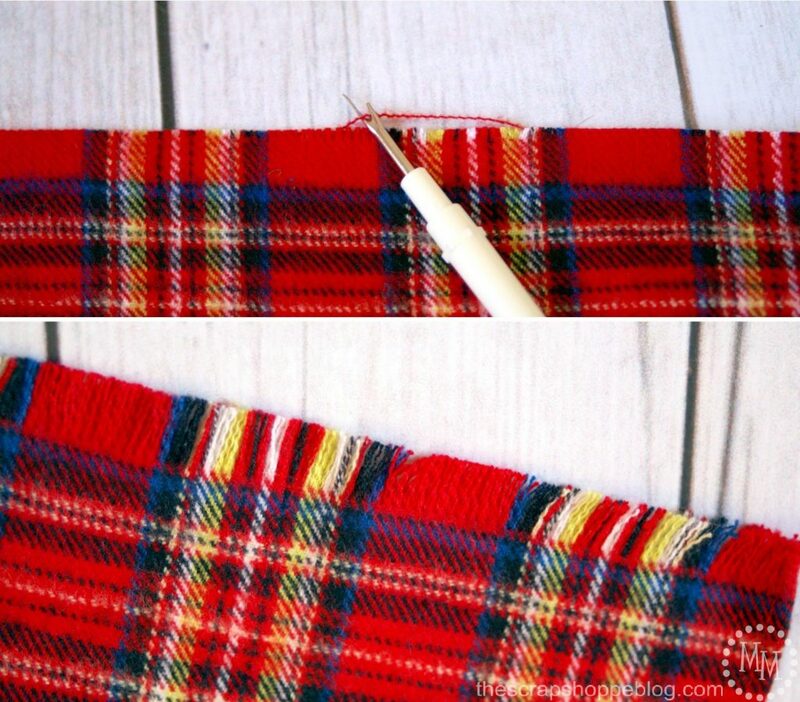 Gently pull out ~10-15 horizontal threads from each end of the shawl to create fringe along the edges. Add a few vintage-looking buttons and the shawl will be†complete! 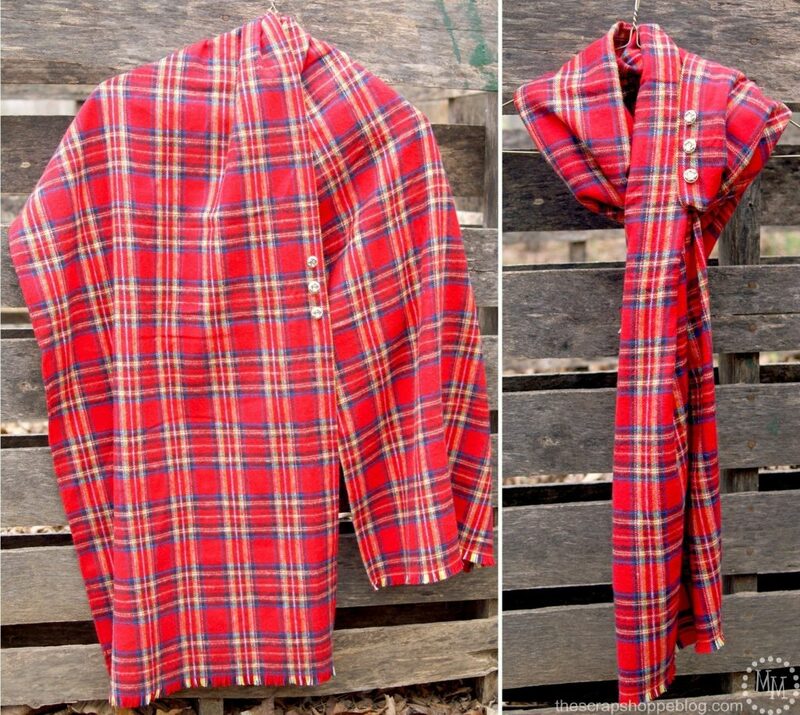 Drape the shawl around your shoulders to decide where best to†place the buttons along one edge of the fabric. There are so many fun ways the shawl can be worn! Drape it, wrap it like a scarf, and even wear it as the ever popular infinity scarf. However it is worn, it is sure to be warm and snugly. And plaid is definitely on trend and fashionable right now! The perfect gift, right? Quick, easy, and trendy! Michele is a wife and mommy to 2 little boys. She recently gave up her job in the field of science to pursue her dream of spending more time with her boys and becoming a full time blogger. When she’s not playing superheroes or building Lego mansions you can find her creating at The Scrap Shoppe. She doesn’t shy away from any type of media so you never know what sort of project will show up on her blog next! I just love this kid craft idea! Make this Holiday Pom Pom Chalkboard Wreath for a fun kid craft idea! And, she has super yummy recipes. This Popcorn Peppermint Crunch is a great last minute treat idea to throw together for neighbors and friends! And, this Scripted Ribbon Poinsettia Wreath is so pretty you can leave it up all winter long! I just put this on my to-do list. 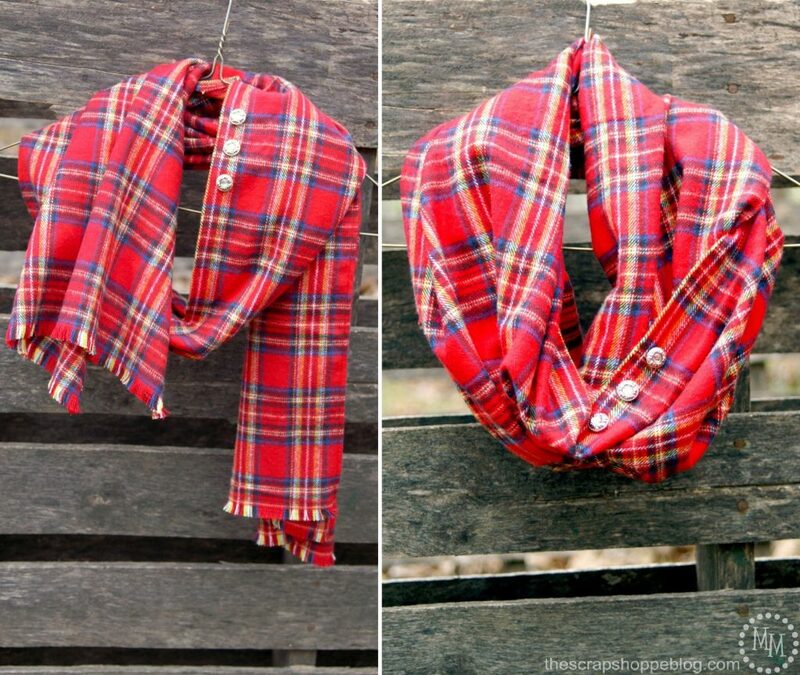 Love this plaid shawl. Michele I love this so much! The scarf is gorgeous and the buttons finish it off perfectly What a great gift idea!.